Operation office is located at Maspion Industrial Estate, Manyar-Gresik, East Java and started operation since 1998, it is Jetty Operator for loading/unloading liquid and gas cargo to serve the activities of manufacturing companies inside Maspion Industrial Estate and surrounded area with. Until now we have Capacity 4.500.000 MT/Year with 140 Man power to gear up the business. PT. Siam Maspion Terminal committed to provided the Effective, Efficient Loading/Unloading Services & Enviromental Friendly With Safety & Healthy First Concern For People As Standard & Complying Health & Safety Regulations, And Doing Continuous Improvement. To Be Indonesian Leader In Operational Jetty Services Through Sustainable Development Port of Our Customers. Provided Benefit and Efficient services to our stakeholders. To Develop a high performance both system and people to sustainable our services. To Built excellence in communication for enhancing Customer Satisfaction. To Operate our jetty servicescomplied with a safety, health, and enviromental regulation. 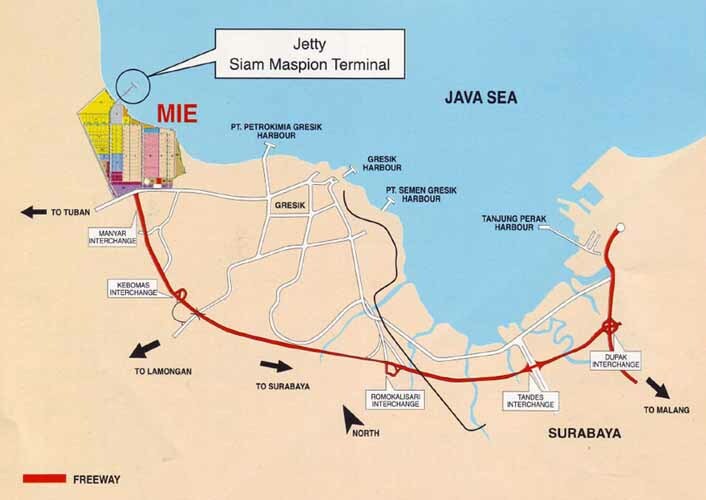 Located near toll exit of the manyar, Gresik and Golden roads make pt siam maspion terminal dock very superior & excellence choice for your business.